Are not competing against graduate students for stage roles or classes. The Department does not have an MFA graduate program and thus focuses all of its energies on its undergraduate students. ‌The Musical Theatre program offered by the Department is a highly competitive conservatory based program. 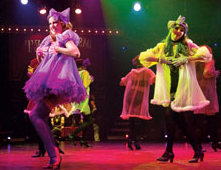 Unique in its approach, the Musical Theatre program is complementary to the Performance program. The student is trained to be a singing actor who possesses a solid vocal and acting technique for work, not only on the musical stage, but also in non-musical theatre as well. Rounding out the curriculum is the sequence in dance and movement that embraces all forms of movement and dance techniques necessary for a successful career in theatre. Students are exposed to a wide ranging repertoire of plays both in the classroom and during our production season.